this is a bright (IPS Super TFT) 7" TFT display with incredibly high resolution and great angle-visibility! 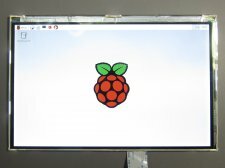 We tried to get the thinnest, brightest, highest resolution display that would be good for embedded computing usage. The visible display measures 7" diagonal and is a 'raw LVDS' display as is used in a tablet which makes it ultra thin and very bright. We include a driver board with HDMI, VGA and Composite inputs. The setup is very easy to use - simply connect a 5 to 9VDC adapter to the 2.1mm center-positive DC jack, then connect a digital video source to one of the ports . We ship with a HSD070PWW1-A display. Display dimensions: 105mm x 160mm x 3mm / 4.1" x 6.3" x 0.1"